Still playing with compact loops after building my own as shown here I obtained a second hand AMA3 by Käferlein http://www.ama-antennen.de/ (no longer made) covers 13.9 to 30MHz at the at FRARS rally. After an embarrassing exchange with the manufacturer. I discovered that the previous owner had written the wrong model number on the handbook ! Its actually an AMA-6 covering 6.9MHz to 25MHz. It has a huge variable capacitor inside (not butterfly unfortunately) which is worth what I paid for the complete antenna and controller alone. Nice heavy duty 1&1/2diameter tubing, bolted directly to the end of the variable cap. Although even this heavy duty construction still introduces some losses at the connection points. 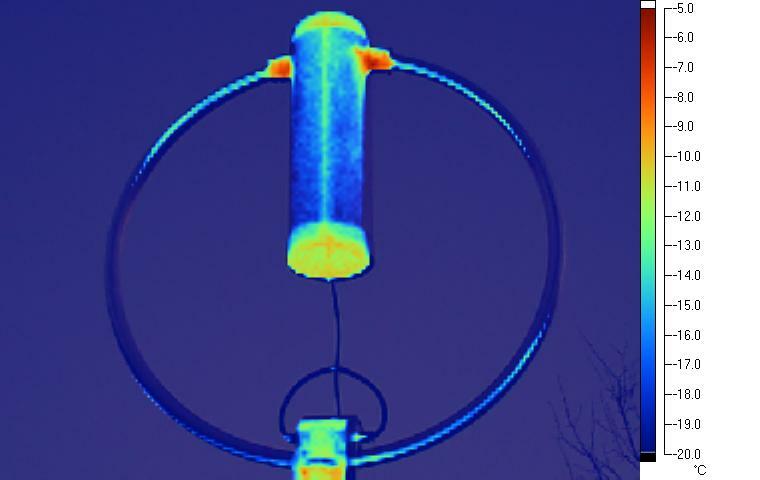 As can be seen in this thermal image (ignore the top and bottom caps - heat escaping due to thin plastic caps and mounting bracket - due to sun). Whilst I was fiddling with the capacitor to try and reduce the minimum value of capacitance it could achieve. I found that the rotor contact left rather a lot to be desired. This caused variations in the best match that could be achieved when pulsing the tuning control backwards and forwards. So I cut up the capacitor and rebuilt it. So that there are now two sliding friction joints. One either side of the insulating back panel where the capacitor attaches to the loop. I can now set the tension on the spring compression washers which form the sliding joint. This has significantly improved the value of series resistance measured with the VNA and provides a more consistent match when tuning. Another problem was RF on the motor DC control cable. I noticed this when I was looking at the radiation pattern with a fluorescent light tube. The DC cable was radiating as much as the loop. So I built a Bias T as designed by GM3SEK and described on his website (also published in the April 2009 issue of Radcom) into the feed point connector box. Phil AD5X also has a similar design on his website. This has solved the control cable RF leakage problem, and I now only need the one coax cable to the loop. This is a much tidier solution. Although I have to use a floating supply, in order to permit the voltage to be reversed when driving the motor in the opposite direction. 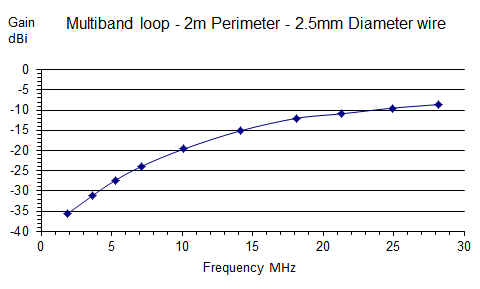 On average when operating on 7MHz, I'd say the loop mounted at 2m AGL is about 6 to 10db down on a ground mounted 1/4 wave vertical. But the RX noise level S/N ratio is about 10db better than the vertical. 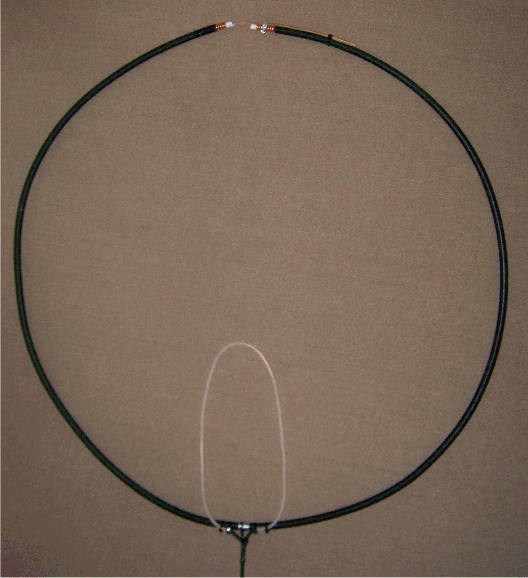 Here's a very quick to build transmit loop for 5MHz capable of handling up to 250w SSB. It uses a 3m long length of LDF2-50 3/8" O.D. Semi rigid coax to form both the loop and tuning capacitor. The LDF2-50 has a capacitance per unit length of 75pF/m). So the loop ended up a bit smaller than I'd hoped for. As I'd calculated the required tuning capacitance would be about 300pF for a 4m circumference loop. In the end it turned out to be something like 330pF with a 3.5m circumference. By using something like LDF4-75. Which has a lower value of capacitance per unit length, or the larger diameter LDF4-50, LDF6-50 or LDF 7-50. It may be possible to further improve the efficiency and power handling. 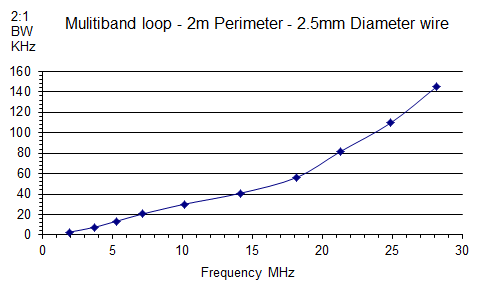 The calculated usable bandwidth is around 3.5KHz. 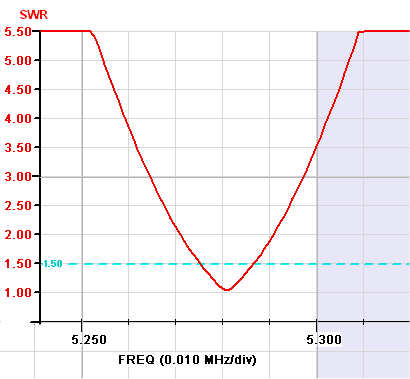 But I measured about 10KHz bandwidth between 2:1 SWR points. With the loop just hanging on a upstairs door frame inside the house, and using 100w of SSB. I was able to work stations throughout the UK, and typically got 5&7 reports from stations about 200Km away. I'd estimate that the performance inside the shack was about 20dB down in comparision to my external 5MHz dipole at 15m AGL. I thought it would work a lot better if it was outside the house, as RF was definately being absorbed by the building structure and various items in the house (EMI). 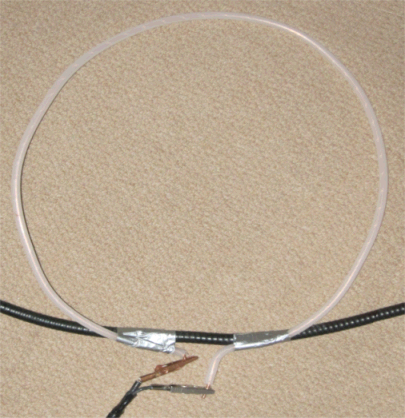 The feed loop is made from a 1m length of coax inner. Tuning is achieved by connecting the inner of one end of the loop to the outer of the other end. This uses the coax capacitance to bring the loop to resonance. By sliding the inner of the coax over the outer of the other end it is possible to tune it over a reasonable segment of the band. You can lock-off the tuning by tightening up the hose clamp. Once you have got the correct tuning point. I'd suggest using two (or more) hose clamps in order to help further reduce the contact resistance at this connection point. Once you have tuned the loop. You can optimise the SWR by either elongating or flattening the feed loop. I also added a 1:1 current balun on to the feed coax in order to reduce common mode current on the feed line. This improves the loop balance, tuning stability and reduces noise pickup on receive. When running 100w the loop current is about 40 Amps and voltage across the ends of the loop is about 3,700 Volts. 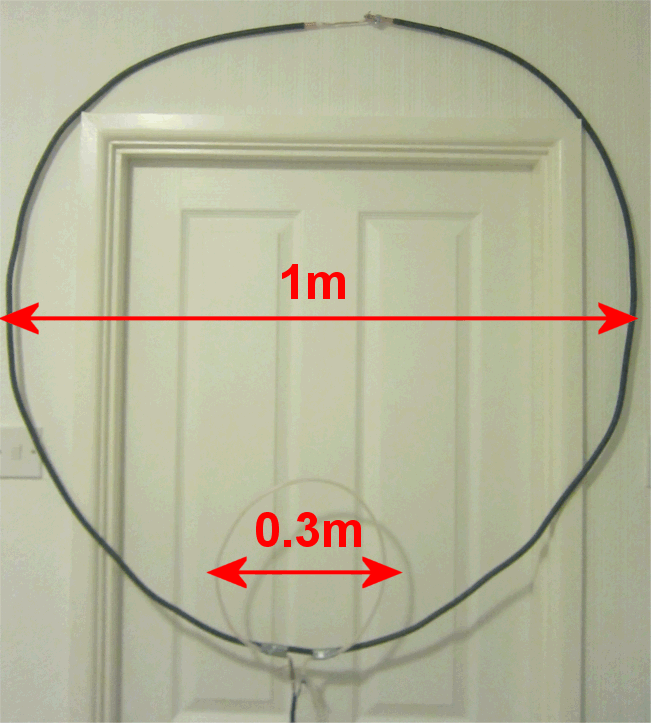 It is noticeable that the first metre of the coax loop, at the opposite end to which the inner core is connected to the outer. Becomes noticeably warm after running 100W carrier for several minutes. This would seem to be where the majority of loss is occuring in the loop structure. This next photo shows what happened when I hadn't left a large enough gap, and used 250W of CW for a few seconds as a test. I managed to get hold of some 1/2" diameter LDF4-50. This has the same capacitance per unit length as LDF2-50. But offers a higher breakdown voltage, larger surface area and much thicker inner conductor. I also found that it was much easier to work with, and held its shape better without requiring further mechanical support. Modelling with EZNEC indicated that with the larger diameter outer screen of LDF4-50 efficiency should improve by 3 to 4dB in comparision to the LDF2-50 I used in the previous version. Here's a photo taken whilst I was still trying to optimise the feed loop. The shape of the loop shown in the photo is a bit unusual, but it still provided a good match. Here's a plot showing the SWR curve and useable bandwidth. Here's a plot showing the calculated gain difference between my external dipole and the two loops. When I mounted the LDF4-50 Loop in a clear spot outside the house. With the top of the loop at a height of about 3m. Performance was about 18dB worse than the external 5MHz dipole mounted at 15m above ground. Further experiments at different positions confirmed a fairly consistent difference of 15dB. This was true even with the loop mounted in the middle of an upstairs room of the house. But sited well away from other conductive objects. The EZNEC plot suggests that the gain difference should be around 18dB at an elevation angle of about 55 degrees (the likely angle of incidence over the measurement path). However I think I was able to obtain better results. Because I was able to orientate the loop for the highest signal level at the Hack Green Web SDR. Whereas the orientation of the reference dipole was fixed. Plus the dipole matching network could easily have introduced another 1 to 2dB off loss. So these figures would seem to be about correct, and confirms that using 1/2" diameter LDF4-50 provides a noticeable improvement over the thinner 3/8" diameter LDF2-50 coax. I was interested in finding out exactly where the losses were occurring. So I took a thermal image of the loop after running 200W carrier into it for about 5 Minutes. There appear to be three hot spots - I originally thought that these were due to the high voltages at these points causing dielectric stress. However, Owen Duffy has concluded that the heating is mainly due to I^2R losses - see his blog for a much more detailed explanation - thanks Owen ! 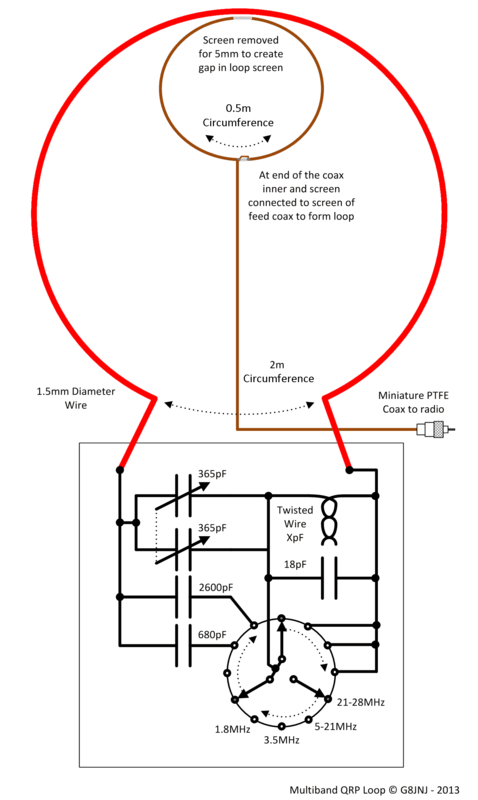 Here is a circuit of simple HF Loop antenna suitable for QRP operation on all bands from 1.8MHz to 29MHz. I originally built this for RX direction finding so that I could locate the source of some interference. I found that it also worked quite well on TX. Although the tuning is quite sharp on some bands. The different frequency bands are selected by means of a four position rotary switch. This selects different values of fixed capacitors in various series / parallel combinations in order to achieve resonance on the required frequencies. The capacitors are Silver Mica rated at 500v working, and the variable is a small air-spaced model. These provide a working upper TX power limit of around 15watts. The capacitor that is formed from a short length of twisted PTFE insulated wire. Is used to adjust the highest frequency of operation on 28MHz. This also affects the frequency coverage around 21MHz when the variable capacitor is set to maximum capacity for the same switch position. Some twisting and untwisting of the wire may be needed to obtain the required frequency range. It is possible to use a switch with more positions and some additional capacitors, or use a variable capacitor with a higher value of maximum capacitance. 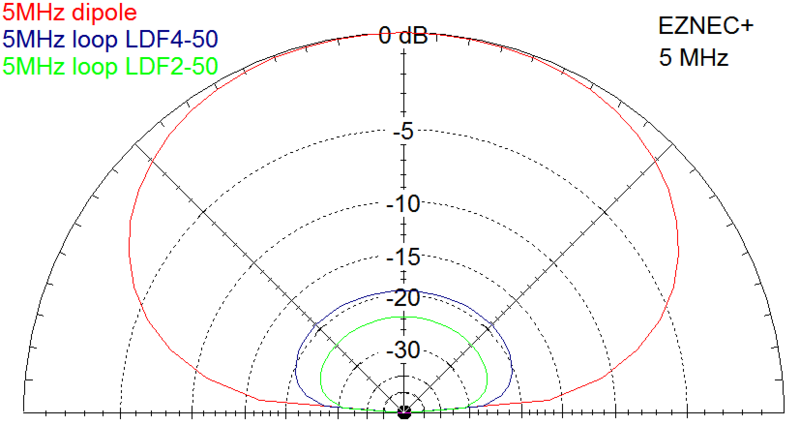 In order to achieve a better overlap between each of the switched frequency bands. However the present arrangement works OK for me. The tuning is quite sharp and a large diameter insulated tuning knob. Helps to reduce the effect of hand capacitance whilst adjusting the variable capacitor. The screened coupling loop is made from small diameter PTFE coax. The screen on the coax is disconnected at the mid point for a length of about 5mm. At the end of the coax feed loop. 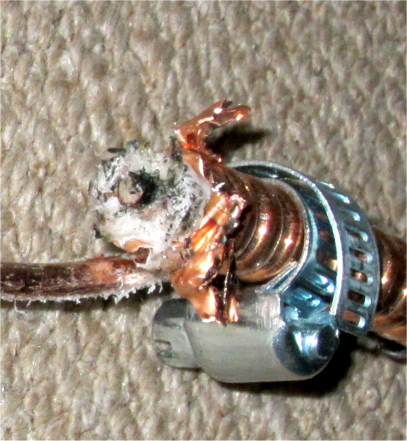 The inner and screen are connected together and soldered to the outer screen of the coax at the start point of the feed loop. You may need to experiment with the shape and position of the feed loop slightly. In order to obtain the best match over the entire operating frequency range. I had to fasten part of the feed loop so that it was in very close contact with the top of the main loop. So the feed loop eventually looked slightly triangular in shape. Once I'd determined the correct position and dimensions. I fastened the two loops together with heat shrink sleeving. The thicker sections on the loop are where I added some extra plastic tube in order to provide a mounting point for the support rods. 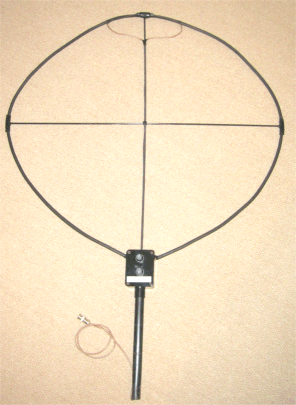 It may also be possible to build a portable version of this antenna. I'd suggest using satellite TV coax. Which is fairly stiff. To form a self supporting main loop. Fit 'F' connectors on each end of the coax and use mating sockets on the tuner box. The feed loop coax could be connected to a BNC plug and socket on the top of the tuner box. The loop can then be connected, or disconnected and folded up as required. 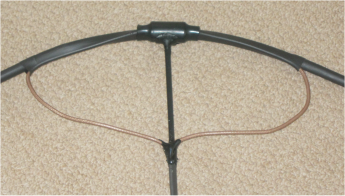 Here is a picture showing the finished antenna. Using this tool I measured the 2:1 SWR bandwidth of the loop on various amtateur bands and plotted the predicted gain in dBi. 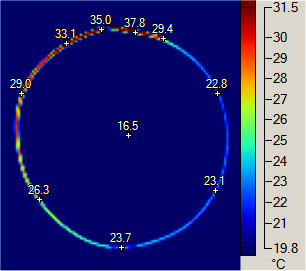 The results were very much as expected for this size of loop and conductor diameter. The performance on the HF bands is just about adequate, but on frequencies below 14MHz it's usefulness on transmit is questionable.